Although laughter may be the best medicine, what saves medicine? When a patient is counting on their healthcare system to help them, what has and will continue to help medicine do its job well? Is it money? Is it celebrity? No, money helps a little, but it is the hard-working and dedicated people that do their best for their patient—and their ethical grounding. Medical ethics saves medicine and its related scientific fields. Film can bring medical ethics to students and interested viewers and can lead to thought-provoking discussions of issues. Doctors Henri Colt, Silvia Quadrelli, and Lester Friedman [the editors of this book] have assembled a volume of medical ethics cinemeducation: a collection of essays depicting specific scenes [with DVD timing] from film that can be used as a tool to teach various facets of medical ethics. 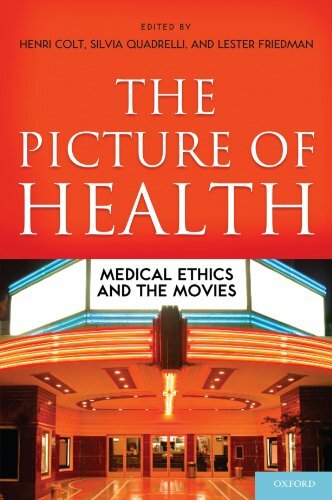 The Picture of Health: Medical Ethics and the Movies contains 84 mostly well-written essays by independent contributors. The essays range from broad overviews to technical dissections of a particular medical ethics topic. Most are three to four pages in length, written for the instructor, but could be used by the student in some cases. Although designed to be used at the college level, particularly in health care-related fields, it could be used as food for thought in upper secondary education as well. Film-orientated instructors may also be interested in this collection. Picture of Health begins with four essays covering Personnel Reflections of using film in teaching medical ethics, invoking Frankenstein, the “modern Prometheus,” from the start. You’ll be interested in this essay, and it is very clear that the contributors are passionate about bioethics and film. The other eight sections focus on specific scenes from films depicting Autonomy, Justice, and Informed Consent; Professionalism; Communication and Provider-patient Relationships; Health Care Policy and Social Responsibility; Rights, Responsibilities, and Research; Reproduction, Genetics, and Sexuality; End of Life and Right to Die; and Other Medical Issues including medicine and religion, futility of care, and organ transplantation. There is an additional filmography in back as well as an index. Each essay has notes and references. These essays will challenge you to think differently and broadly, engaging you in an aspect of medical ethics that you never thought of. Contributors hail from mostly medicine, but also law, bioethics, philosophy, nursing, and various areas of the arts and humanities. Some of the best essays (because of either a challenge to a common viewpoint or unique approach to topic) center around films such as A Beautiful Mind, Vera Drake, Malice, Drunks, Passion Fish, As Good as It Gets, Article 99, Gattaca, and The Barbarian Invasions. An essay by Dr. Mohsen Davoudi, an Assistant Professor of Pulmonary and Critical Care Medicine, stands out for its overview of codes of ethics—from ancient Athenean views to Nuremburg to current American Medical Association codes. Most health care-related fields have a code of ethics or covenant, and this essay highlights their importance. More specifically, a scene from The Lives of Others is used to illustrate a physician’s obligation in times of oppression, not something we always think about (but should) here in the United States. Access and rights to health care is a polarized ethical issue, particularly in the U.S., but Dr. Lawrence Mohr, Professor of Medicine in Environmental Bioscience, handles it in a beatifically unbiased way. Whether you are on the left or right of center on the issue of “right to health care,” you won’t fault his explanation of the viewpoints. Secondly, his lively description of the scene with mad Veterans in “Article 99” discussing rights to access health care will convince you to watch the movie whether you are interested in medical ethics or not. There are many good essays in Picture of Health, but the most heartwrenching and readable is by Alexander Capron, Professor of Law and Medicine. There is a Brave New World quality to this essay, perhaps due to the topic of genetic engineering. But his chosen scene in Gattaca is that of dystopian novels—with genetically-modified babies referred to as valids and regularly conceived ones as in valids, faith births, or de-gene-erates. Gattaca is a tale of “. . . the battle of free will over genetic determinism . . .” and this essay covers the moral ground of genetic engineering very well. My overall impression of the collection is very favorable, but a couple essays fell short. One essay had obvious errors, mentioning “Prince Diana” and that Tommy Thompson was President Clinton’s Health and Human Services Secretary in 1996 when HIPAA was passed—he was not. It was Donna Shalala. Another essay stretched uncontrollably to use a scene from To Kill a Mockingbird to illustrate gender discrimination; it didn’t convince me. Certainly these essays cover scenes from films that will make you laugh, tear up, sob, jump around hopping mad, but mainly think. Using film to teach medical ethics is not new, but a book to do so is. This volume is a worthwhile addition to your bioethical or film library—a wonderful intermingling of the two fields. Thoughts stimulated by these film-scenes and discussions will inspire students to keep medicine alive—and save it if necessary.